Martin Professional today announced the RUSH Wizard ‘full-house’ effect light for mobile DJs, nightclubs, bars and other leisure environments is now shipping. As the latest member of the RUSH by Martin line of affordable lighting solutions, the RUSH Wizard is an extremely bright yet energy-efficient fixture providing high-quality mid-air effects. The RUSH Wizard is music-triggered and DMX-controllable with two independent colour/gobo wheels offering seven colours (plus two whites) and 13 different gobos with an additional two open patterns. An advanced shutter system allows the Wizard to create fast strobe and pulse effects as well as blackouts and a unique instant open. The Wizard’s powerful ‘full-house’ club effect produces more than 80 light beams with each beam chasing the other while also continuously changing colour and gobo pattern. It also features adjustable focus and a stand-alone mode for easy control as well as a 130W short-arc discharge lamp which creates powerful effects via a reflector. 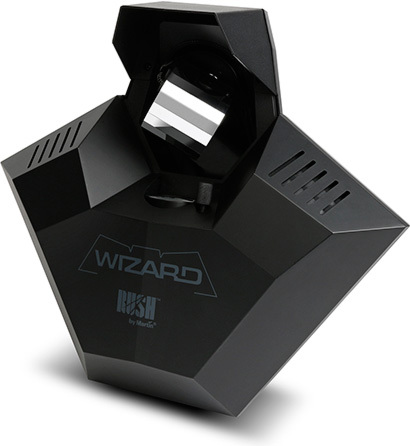 In addition, the RUSH Wizard comes equipped with mounting brackets for easy installation on walls and ceilings as well as T-bars and other stands, making it ideal for mobile DJs in need of portable lighting.